If you’re building applications or migrating workloads to the cloud, you’re probably like most organizations – trying to determine what security controls are needed, and how to integrate workload security without slowing down innovation or needing to add dedicated security staff – which these days is harder to find and more expensive to keep. The economics of security are getting harder to balance. More than ever, companies require an agile security operations strategy to respond to changing infrastructure needs. To meet this need, many organizations are choosing to partner with Security-as-a-Service Providers to augment their security capabilities with technologies and expertise for 24x7 monitoring, threat intelligence, public cloud security, log management and compliance reporting. 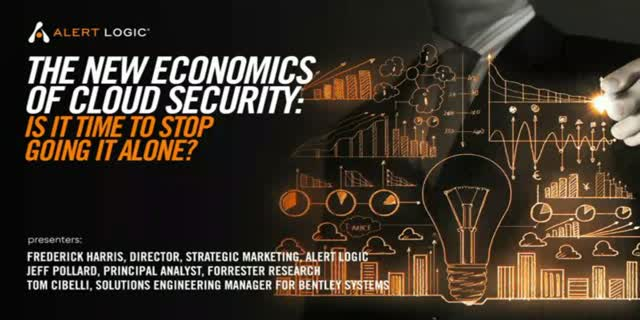 Join this webinar for an in-depth discussion on the value of working with a Security-as-a-Service Provider, featuring Jeff Pollard, Principal Analyst at Forrester Research, and Tom Cibelli, Solutions Engineering Manager for Bentley Systems, a multinational provider of software solution and services for the design, construction, and operations of infrastructure. Register now for "The New Economics of Cloud Security" to understand how the right Security-as-a-Service partner can help you address and remediate risks, meet compliance requirements and increase your security posture.